Mapping mashups have become extremely common in the web 2.0 as developers have leverages web services to combine data with maps of Earth. 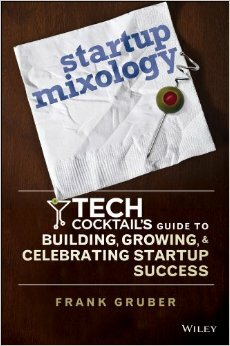 I recently had a close encounter with a mapping mashup of a new kind called Sloog.org. Sloog.org is a bookmarking service for Second Life residents and offers a unique mashup experience because rather than plotting items to a map of Earth, it plots location in the virtual world, Second Life. That's right, Sloog.org leverages a tagging infrastructure to offers users a way to search Second Life. Sloog.org is free and enables users to tag and search both places and avatars. Users (with Second Life access) can also teleport directly to visit locations bookmarked with the service. 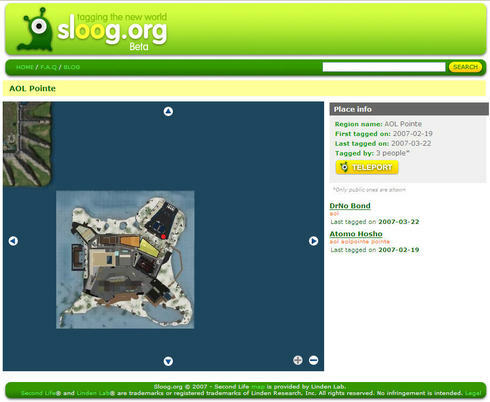 Sloog.org showcases some of the most recently visited and most popular places like Mercedez Benz Island, Virtual Morocco and Mosi-Mosi Headquarters. I did a search and found AOL Pointe, the AOL virtual real estate, and displayed the results below. Sloog.org is a product of the Barcelona-based multimedia studio Mosi-Mosi. They are determined to make Second Life and a better place. To stay up to speed with the latest Sloog.org happenings check out the official Sloog.org blog. Bottom-line: Sloog.org is a social bookmarking services for Second Life that offers users a great way to search and discover new parts of the virtual world.